This blog post may more accurately be named “Flower Power at Vista West Ranch” due to the enormous amount of gorgeous flowers that were used in this wedding! You see, Lyndee is no ordinary bride – she’s a recovering florist. That’s right. Lyndee and her mother, Lisa, were the owners of Lisalyn Designs Floral, before moving on to other dreams. And this was the last hurrah before they closed up shop – and boy did they rock this out! Lyndee’s wonderful momma contacted me last year when Lyndee got engaged to Caleb and I was ecstatic! Beyond being super excited for Lyndee, it was such a huge huge honor to be chosen amongst the tons of choices that they had for wedding planners! I mean, they’re amazing florists and they’ve worked with a lot of other vendors. I may or may not have jumped up and down (and screamed like I’d won an Emmy) after I got their call that they’d chosen us. Just sayin’. Anyhow – they chose the always perfect Vista West Ranch as their venue. 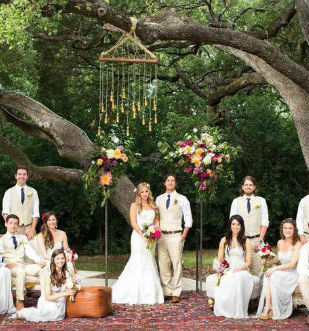 Because there are so many weddings at this venue it’s easy to fall into the same old decor. But not for Lyndee! We worked hard to make for sure that each element of their wedding was unique to them and had not been seen at Vista West Ranch before. We had such a hard time choosing which pictures to show you – because there were so darn many great ones taken by Lisa Woods Photography! Seriously one of my favorite pictures of them! I don’t think Lyndee stopped smiling the entire day! Notice the small piece of jewelry on the bouquet? It’s a locket that I picked up and we placed a picture of Lyndee (as a child) and her dad inside. Loving this ceremony site! Lyndee’s mom made the boxes that line the aisle. There were actually several pages of this program that Lyndee made herself – and Lisa, her mom, sewed together! Transportation Consultants found Lyndee & Caleb this fantastic classic truck – and of course, we turned it into a lemonade stand – what else!? Yes, that’s a dresser! With snacks in it! Love this so much!! Oh my gosh! We actually narrowed it down to our favorite 100 pictures – yes 100! But we’ll go ahead and stop now because rumor has it that this wedding will be featured someplace very special – details to follow – but our lips are sealed for now.